Well, the question of whether M.R. Carey could catch lightning in a bottle twice has been answered. Not that I had doubted it much, but while The Girl with All the Gifts was met with much acclaim, I’d made sure to temper my expectations for its follow-up companion novel in the months up to its release. Given the infuriatingly vague publisher description, and with the newness of the whole idea, there were just way too many unknowns. Thankfully, The Boy on the Bridge came through with flying colors. It might not have been quite as fresh as the original, simply because we know so much more about the world now, but the book still had plenty of surprises in store. 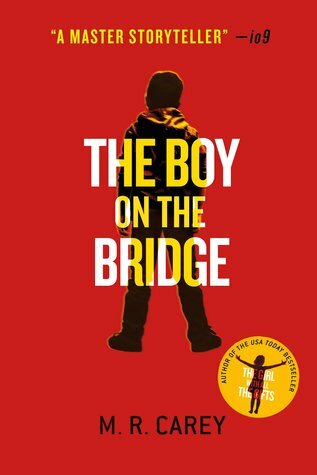 Here’s what I can tell you: The Boy on the Bridge is something of a prequel to The Girl with All the Gifts but it can be read as a standalone (though I still highly recommend reading the books in their publication order). The world has been ravaged by the Cordyceps plague, turning much of its population into “Hungries” — effectively just another term for the walking dead. And yet, humanity still has hope that it will find a cure, sending scientists and other brilliant minds into the wild to see if they can bring back any helpful information. The story follows one such expedition, made up of the scientists and soldiers of the Rosalind Franklin. Affectionately nicknamed Rosie, the armored tank/motor home/mobile laboratory is specifically built for many months of travel through the Hungries-infested wasteland that Britain has become. The key characters include Dr. Samrina Khan, the team epidemiologist, as well as an autistic boy named Stephen Greaves who is ostensibly accompanying her as her assistant. Though Stephen’s presence is unorthodox to say the least, none of the other scientists are about to question Dr. Khan’s insistence that the young man is special or that he can bring invaluable insights to their mission. Six soldiers are also along for the ride, charged with protecting the Rosie and her precious cargo of civilians, scientific equipment, and biological samples. However, just a few weeks after their departure, Dr. Khan receives some life-changing news. But it’s too late to turn back now; she and her colleagues have a job to do, and the future of everyone—including the next generation—rests upon any useful data they can bring back. If you were like me and found yourself completely in awe of the world in The Girl with All the Gifts, then you’re in for a treat. This prequel explores many aspects that were only lightly touched upon in the original book, and with the Breakdown still fresh enough on people’s minds, there’s a noticeable difference in the overall attitudes of the characters. While it would be a stretch to call this a happier book, the prevailing mood at the beginning is arguably still one of hope and measured optimism, and that despite the horrors the world has seen, humanity believes it can save itself and make everything right again. After all, this is what the Rosie was meant for, and in a strange way, the armored vehicle almost becomes a character in its own right, symbolizing that conviction. Gradually though, the hope fades, followed by a stifling sense of desperation. Confine a group of scientists and a group of military personnel into the same claustrophobic small space for months on end, and you’re guaranteed to get some kind of friction. Throw in the pressures of their mission and the threat of Hungries and junkers, it’s a wonder that the team has survived together this long at all. While Dr. Samrina Khan and Stephen Greaves may have gotten the most attention simply based on amount of page-time, the ten other characters on board the Rosie also have their own personal background stories and fleshed-out personalities, leading to a lot of interesting dynamics. This aspect sets The Boy on the Bridge apart, enhancing the story with side-plots dealing with complicated friendships and enmities and details of secret alliances and betrayals. Keeping in mind that all the events in The Girl with All the Gifts are still in the future, there’s also a lot the world doesn’t know yet, so the fears of the Rosie crew are understandable. If you’ve read the first book, this is where the mystery loses a bit of its grip, but it’s still easy to see how the stresses caused by the strange happenings can start to take their toll, once you put yourself in the characters’ shoes. The real shockers are all left for the end, because even though we already know that the Rosie will bring home no cure to save the world, it’s the whys and the hows of it that will ultimately be the most revealing. In fact, in some ways this makes the ending feel even darker and more unsettling, especially once the realization hits that everything we know about this world had rested on the outcome of this novel. Whether you’re picking up The Boy on the Bridge as a newcomer or because you’re a fan of The Girl with All the Gifts, this one will be a fascinating tale guaranteed to pull you in. Highly recommended. He’s awesome! Start with The Girl with All The Gifts! I liked the first book and based on what you’ve said, I certainly want to read this one now! Great review! I would definitely recommend it to readers who loved the first book! I always think prequels are interesting, and this one is no exception. As I’m halfway through, I’ve just discovered what ties this and TGWATG together, and I can’t wait to finish this story now! The Girl With All The Gifts had me so curious, and I wanted to read it but haven’t yet (and I heard they made a movie as well) so this prequel is interesting. I like the idea that it’s hopeful at first but gradually the hope fades- kind of a bummer lol but sounds realistic since the next book doesn’t have a cure. These sound like good reads. Yeah, I think the adaptation was a limited release/straight to video movie. I’d like to check it out one of these days! Hope you enjoy these books once you get a chance to get to them, definitely start with The Girl With All The Gifts first if you can! Oh man, I still need to read The Girl With All the Gifts. But you make this sound so good! They’re both excellent books! I hope you get a chance to read TGWATG soon! I set this aside just so I could finish a different book before it’s release. I am SOO looking forward to getting back to it! I hope you’ll enjoy the rest of the story! It gets really good! I only skimmed this because I do want to pick it up. Glad to see you enjoyed it so much though. I enjoyed this one a lot too! Still working on my review though. I’m such a big fan of The Girl with All the Gifts. I didn’t connect with The Boy on the Bridge, though, until pretty late in the book.